Canvasbacks took center stage last Friday, June 27, for hunters, conservationists and stamp collectors as the new Federal Duck Stamp went on sale according to a U.S. Fish & Wildlife Service news release. The 81st Federal Migratory Bird Hunting and Conservation Stamp, as it is formally known, debuted at a special event hosted by the U.S. Fish and Wildlife Service and Bass Pro Shops at the Department of the Interior in Washington, D.C. 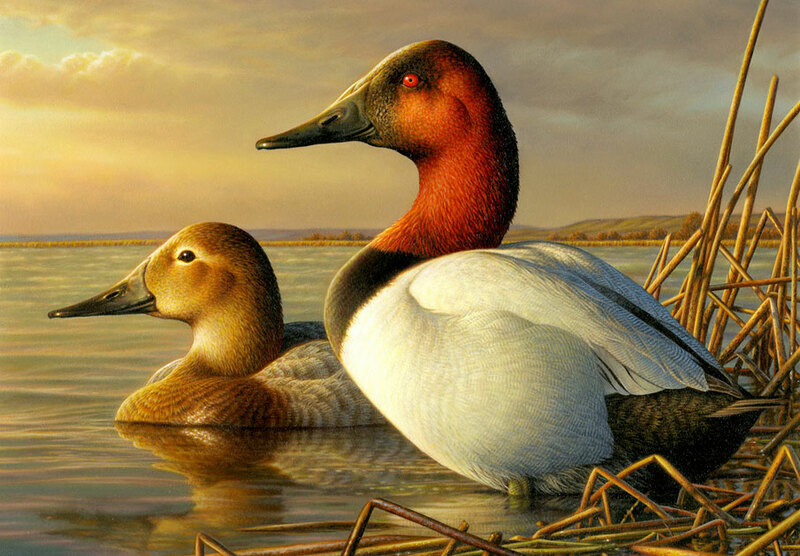 The 2014-2015 stamp features a pair of canvasbacks painted by wildlife artist Adam Grimm of Burbank, S.D. Last fall, the USF&WS reports that a panel of five judges chose Grimm's art to grace the stamp from among 202 paintings at the Federal Duck Stamp Art Contest. Grimm is a two-time contest winner; the U.S. Fish & Wildlife Service (USF&WS) said that his painting of a mottled duck appeared on the 2000-2001 Federal Duck Stamp. The new Federal Duck Stamp, which costs $15, is valid through June 30, 2015. The USF&WS indicates that 98 percent of the proceeds from the stamp go to the Migratory Bird Conservation Fund, which supports wetland acquisition for the National Wildlife Refuge System. "Duck stamps are one of the traditional ways hunters and others give back to conservation," said Ducks Unlimited CEO Dale Hall, in a DU news release. "We encourage everyone, whether they hunt waterfowl or not, to buy a duck stamp to help conserve our precious wetland resources. "Many duck hunters even 'double up' their contributions to this conservation effort by buying two stamps every year." DU reports that Si youn Kim, 16, of Tenafly, N.J., took top honors in the 2013 National Junior Duck Stamp Contest with an acrylic painting of a king eider. That painting will be featured on the 2014-2015 junior duck stamp, which sells for $5, and the funds go toward environmental education. The Fish & Wildlife Service, which oversees the duck stamp programs, hosted its annual first day of sale ceremony last week at the Interior Department in Washington, D.C.
A "second day of sale" took place on Saturday, June 28, at the Bass Pro Shops location in Rossford, Ohio. Grimm, an Ohio native, and winner of the 2013 Ohio Wetland Habitat Stamp competition, was at the Bass Pro Shop store to sign his winning Ohio Wetland Habitat stamp and federal duck stamps. DU indicates that Grimm also displayed some of his artwork while his daughter, Madison, the recent winner of the 2013 Federal Junior Duck Stamp contest, joined him. Since 1934, the USF&WS says that sales of the Federal Duck Stamp has raised more than $850 million to acquire and protect more than six million acres of wetlands habitat on hundreds of national wildlife refuges spread across all 50 states and U.S. territories. Hall said that while the 81-year history of the duck stamp is a good one, DU and others are hoping that the future is even better. "DU and other conservation groups continue to work hard in Washington to raise the price of the duck stamp, which has remained unchanged since 1991," said Hall, in the DU news release. "We need this increase to help keep pace with inflation and retain the ability of duck stamp funds to conserve habitat. "We hope hunters and others conservationists will support this increase when it comes before Congress again in the future." Waterfowl hunters age 16 and older are required to purchase and carry a duck stamp while hunting. A duck stamp also provides free admission to national wildlife refuges (NWRs) that are open to the public. Duck stamps are sold at post offices nationwide, online through the U.S. Postal Service, at www.duckstamp.com and at many NWRs and sporting goods stores. Electronic versions of the duck stamp can also be purchased online, visit www.fws.gov/duckstamps for more information.